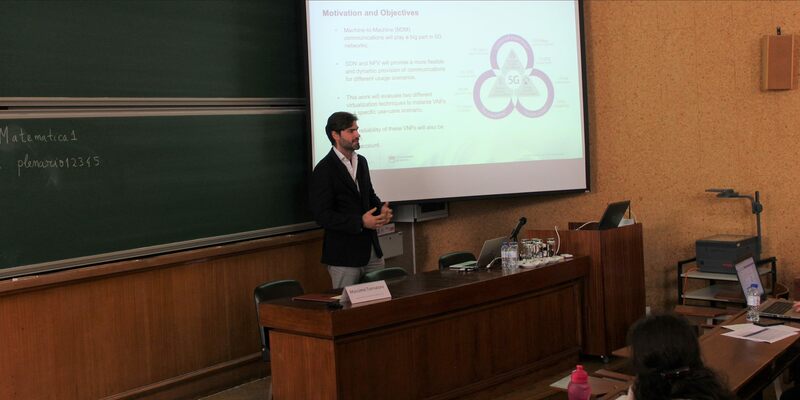 Dr. Daniel Corujo, on the 20th of March at the Departamento de Matemática of the Universidade de Coimbra, in Coimbra, Portugal, presented the work of the Instituto de Telecomunicações for the “M2M communication products and services” PPS3, entitled “A Performance Comparison of Containers and Unikernels for Reliable 5G Environments”. This paper has two main contributions. First, it compares the use of two virtualisation technologies, namely containers and unikernels, for virtual network function (VNF) instantiation in computational limited resources, envisioning the deployment of VNFs close to the end-nodes contributing to facilitate resilient communication networks in critical scenarios. Second, it addresses a concern that the probability of failure increases with the hardware limitation, imposing the development of failure detection and recovery mechanisms. In this line, a failure detection and recovery mechanism were developed, able to ensure VNF reliability by dynamically instantiating a backup VNF before failure and using SDN to redirect the necessary data flows. Finally, the results evidenced that such mechanism was able to ensure near zero downtime, showcasing the feasibility of the solution.